These children spend sixteen hours a week walking ten miles between the villages of Lavoute and Fort Jacques in the western highlands of Haiti delivering charcoal made by their family and sold at the market in Fort Jacques. The four girls ages ten to fifteen have been helping their parents with the tough job of survival in the mountains of Haiti for several years now. The girls are also students at the Love a Child School in Lavoute. Because a large amount of charcoal needs to be sold to provide a living for the family, the girls are required to take time away from their studies to help the family business. Mission of Mercy, a joint Catholic and Episcopal effort cares deeply for the children living in such bad conditions. Recently, they started "A Donkey Project" to provide some help to these families. Catholic Assistance Missions happily joins them in this effort. One donkey purchased for $150 USD and led my mom or dad, could easily carry all four bags of charcoal. This then would allow the girls to spend more time in school. Because donkeys can carry larger loads faster, they not only save time and energy, they also help to make the charcoal business more profitable. This increase in business profits helps to provide a better standard of living for these families. There is also a positive social impact for a family that owns a donkey. It's like owning a limousine in the city! 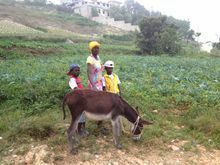 A donkey is a great dream for many families in rural Haiti. A donkey saves time and energy and helps provide a living for the familes that own them. There are many families and many children in rural Haiti on a waiting list to have their dream come true. Thanks to all of you that share with us the dream of... A donkey for every family in Despinasse and Lavoute.